Bruce Willis is a bit of an anomaly these days; for every good movie he signs on to like Moonrise Kingdom and Looper, there’s about a dozen low-quality action movies that even he could not care less about, from all the direct-to-DVD material he’s appeared in to stuff on the big screen like G.I. Joe: Retaliation and, most notable, the dire A Good Day to Die Hard. All of that, on top of reports that he’s not exactly the easiest person to work with – just ask Kevin Smith, who directed him in Cop Out – seems to have tainted his star a little bit, and has led to many people pointing out how Willis just doesn’t seem to care anymore when he’s appearing on-screen. Like many popular actors whose stars have dipped in later years, a career resurgence is all but guaranteed, and someone like Bruce Willis, who can be a good actor when he wants to be, is prime for that big career comeback. His lead role in Eli Roth’s Death Wish, a remake of the 1974 Charles Bronson movie which itself is based on the book by Brian Garfield, certainly isn’t the one that’s going to thrust him back into people’s good books, but it’s still baby steps, because he is at least trying in this one. Willis takes on the Bronson role as Dr. Paul Kersey, a Chicago surgeon who has his world rocked when his wife (Elisabeth Shue) and daughter (Camile Morrone) are attacked one evening by three criminals, leaving the former dead and the latter in a coma. Frustrated by the lack of progress made by the cops, Kersey decides to take matters into his own hands and sets out into the Chicago underworld to find and exact justice on the criminals who hurt his family. Unlike the majority of other reviews for this film, I cannot possibly comment on how this compares to both the original Bronson movie and the book, since I have neither seen nor read those sources. Even with that in mind, it’s not too hard to see how this version of Death Wish isn’t particularly interesting when you put it next to other general vigilante movies, nor is it as provocative or as intelligent as some of those can be. Films like The Exterminator, The Brave One, or even the mother of all vigilante movies Taxi Driver all do far more captivating things with their themes of vigilance and taking the law into one’s hands far more than this does; this is just a very by-the-numbers vigilante movie that’s got a few amusing kills – say what you want about Eli Roth as a director, but he does know how to do a good and gory death scene every now and then – as well as the first legitimately decent performance that Bruce Willis has given in years, but other than that it adds really nothing much else to its substance. Roth, who is directing from a script by Joe Carnahan – a first for the director, who up until now has only made films that he also wrote – never really brings Carnahan’s interpretation to life on-screen, although in his slight defense Carnahan never manages to find something new to say or add to the existing commentary on vigilantism either. Since Roth isn’t a strong enough director to make certain scenes of emotion or suspense work, nor is Carnahan’s script smart enough to take the moral high ground on people blowing others away with a gun and still be celebrated for it (especially at a time where gun control is a more sensitive topic now than ever before), this is a film that just doesn’t work, regardless of what it’s based on. There are lots of clichés and unpleasant scenes of torturous violence that the movie leans too much on, and doesn’t give much room for many of its characters to leave an impression, not even Vincent D’Onofrio who plays Willis’ brother and, in the most shocking (non-spoiler) twist in the movie, ISN’T the villain here. 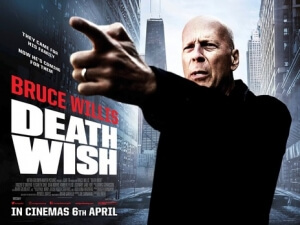 Again, though, as underwhelming as this movie is, whether or not you’ve seen the original Death Wish, it’s good to see Bruce Willis back to caring somewhat about being a lead in a movie again. There are legitimate scenes in this movie where you can tell, more so than any part of A Good Day to Die Hard or whichever one of the many direct-to-DVD films he’s done, that he’s actually committed to giving a somewhat passable performance, and though he certainly has one or two dull moments – though you could put that down to the direction more than anything – he’s better here than he has been for at least half a decade. Death Wish is a generic and by-the-numbers vigilante movie which, regardless of whether or not you’ve seen the original Charles Bronson version, isn’t bound to excite you all that much, although it does feature the first Bruce Willis performance in years that seems like he’s actually trying to be good again.